1 Dragon-Type Synchro Monster + 1 Warrior-Type monster. This card cannot be Special Summoned from your Extra Deck except by Fusion Summon. Once per turn, you can remove from play 1 Dragon-Type Synchro.. This card cannot be Normal Summoned or Set. This card cannot be Special Summoned except by returning all monsters from your Graveyard to your Deck. When this card declares an attack, send 1 monster fr.. This card cannot be Special Summoned. During your Main Phase, you can pay half your Life Points to destroy, and remove from play, all other cards on the field, and this card gains 300 ATK for each car..
"Majestic Dragon" + "Red Archfiend Dragon" + 1 non-Tuner monster. This card cannot be destroyed by card effects. If this card attack, destroy all Defense Position monsters on the field after damage ca..
2 Tuner Monsters + "Red Dragon Archfiend". This card gains 500 ATK for each Tuner monster in your Graveyard. This card cannot be destroyed by the effects of your opponent's Spells, Traps or monsters. 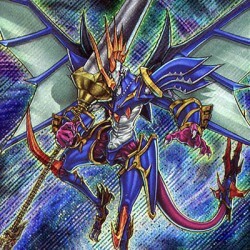 ..
1 Tuner Synchro Monster + "Stardust Dragon". Each of these can be activated once per turn: Reveal the top 5 cards of your Deck. Shuffle them back in, and this card's maximum number of attacks this tu..